For some reason this week, the raspberries in the grocery store were calling my name. I wanted to make something relatively quick and easy, so I decided on these muffins, and boy were they worth it! With the sweetness of the cake and chocolate, combined with the slightly tart bite of the raspberries, I could have sat and eaten all of them in one go! 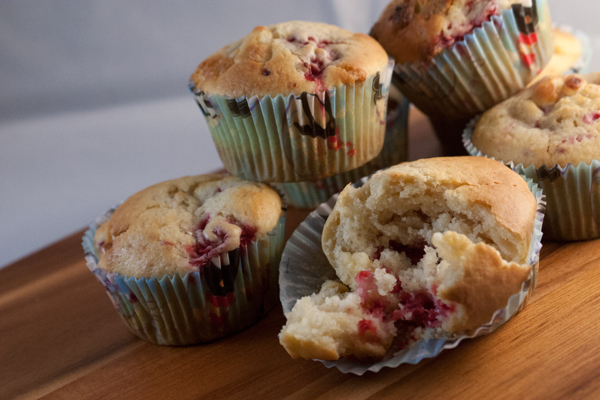 The key to making these muffins is to gently fold in the raspberries by hand at the last minute before pouring into your cupcake tin. That way, the raspberries don’t burst open and turn the whole batter pink. 1. Preheat your oven to 400°F/200°C. Prepare your muffin tin by lining it with baking cases. 2. Sift together the flour and baking poder into a large bowl, then stir in the sugar. 3. In a small bowl, whisk together the egg, vanilla, and melted butter. Pour this mixture into the flour mixture and stir together, then add in the chocolate chips. Finally, gently fold in the raspberries, trying to avoid breaking them open as much as possible. 4. Divide the batter amongst the baking cases, filling each one about 2/3 full. Bake for 30 minutes until they rise above the cases and just start to turn golden on top. Sounds Great! But……..you know how lazy (mentally challenged ??) Yanks are about grams, milliliters etc. Help!! Most of the conversions should be under the ‘weight conversions’ page linked at the top of the page. The white chocolate chips was about a cup’s worth, as well as the milk. Let me know if you need any others!